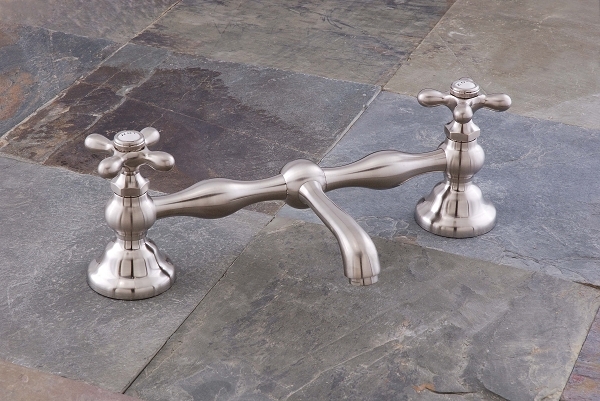 Columbia Faucet Set with Straight Spout has Cross-Point Handles and is available in 8- or 12-inch widths. Shown in Matte Nickel (image). Solid Brass available in Chrome, Polished Nickel or Lacquered Brass, Matte Nickel or Oil Rubbed Bronze finish. Our faucets are constructed with high quality, low lead brass. Our lavatory faucets are lead free per California AB1953. They meet all current regulations with regard to lead composition. All faucets feature 1/4 turn ceramic valves, which consist of 2 ceramic disks that rotate to open and close the valve, minimizing mechanical wear. Includes turn and lift drain.